That’s it! Half term’s finished, summer’s long gone, Halloween’s almost over and the count down to Christmas begins almost immediately. Riley and Sonny have had a week and abit off school and the last few days of the holidays were our kind of bliss. 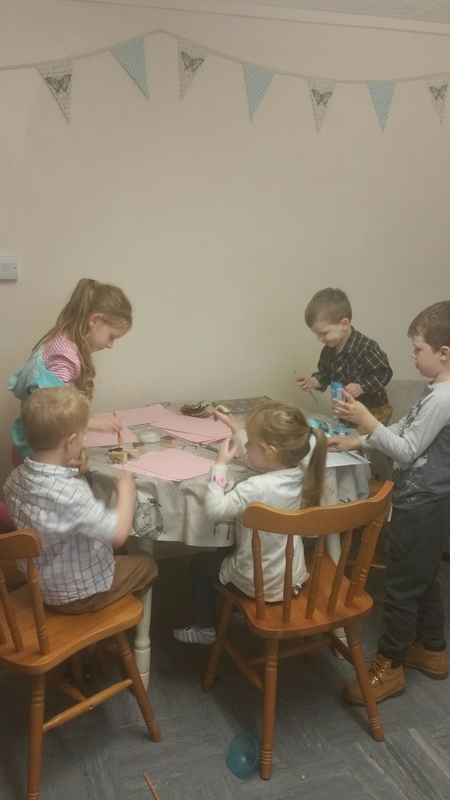 They were settled and really getting stuck into the activities we did. It was full of everything you’d want an Autumn break to be. Long walks, adventures, baking, carving pumpkins and spending time with your family. The boys had their cousins come round to play and with that brings the best sort of fun. I love sitting back watching the mischief they make. It’s important to encourage positive relationships with extended family. It’s those relationships they will look back fondly on in twenty years time. They will reminisce about those times they spent digging in the dirt, running in the fresh air and making up silly games. Me and my sister were trying not to loose our minds with the dirt, the paint, the glue, the food and the spillages. They need the space to express themselves like that don’t they? Even if it meant Sonny giving his little toy dinosaur a PVA glue bath! Sonny you might not realise it but I watched you have so much fun this half term. Not all at once I confess. The start of the week was hard for you, but you embraced all the changes by the end of the week. YOU ARE AMAZING! You loved spending time with your cousins. They love you Sonny. They may not always understand the things you do but they see you for who you really are, crazy, sweet and incredibly funny. You were sitting on the chair by the front window when you saw their car pull up and I’ve never seen you move so fast. You opened the door for them, you always have to be the one to open the door to our visitors. You squealed and hugged them so tight they’d barely got through the door. Zachary and Riley joined you and you all ended up in a group hug at the front door while Auntie Charlotte and Nanny waited to come in. School has started another term and it’s going to be full throttle, not much time to think in the run up to Christmas. School trips, plays, cake sales, the winter fair. The mornings are cold and dark and the little ones are harder to rise from their beds. We take the 20 minute walk to school and it’s chilly out. 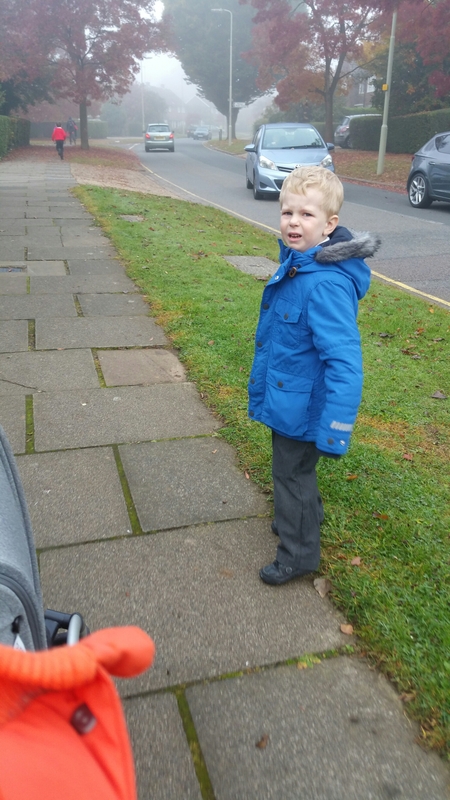 Sonny has become used to wearing his clothes for home, his new boots and coat are a new comfort. It becomes a battle to get him to wear his uniform and he doesn’t want to wear his school shoes. Sonny wants to stay and play with his toys and we end up taking half the toy box under the buggy just to avoid arguments. Getting out the door is half the battle won. Time to get ready for school Sonny. Let’s see how quickly you can get your uniform on! You love to win, you always have to win, it makes you so cross when you loose. I try to help you understand it’s good to share, when we share everybody is happy. When you don’t win you throw yourself on the floor and scream and cry. You throw whatever is in your way and it takes lots of patience to calm you down. Riley let’s you win Sonny, he likes it when your happy. He pretends to struggle to get his arms through the sleeves of his jumper or that he just can’t get his socks on. You laugh and cheer when you beat him. We all laugh. I give Riley a little wink and a cuddle to say thank you. He’s a good boy. 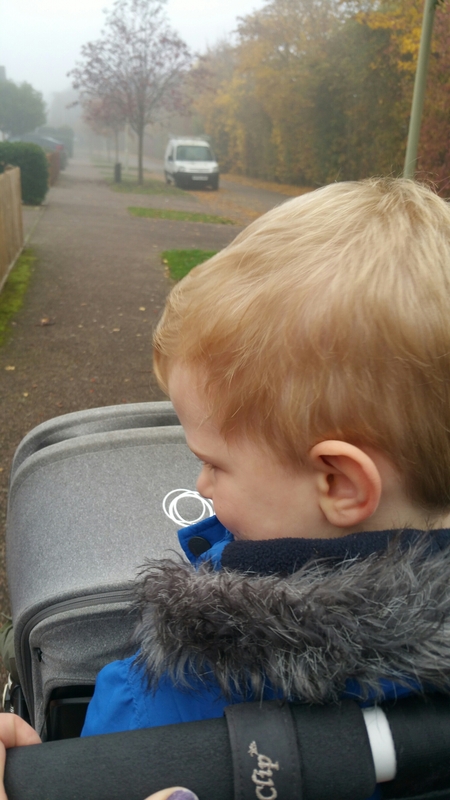 Zachary is usually in the pushchair for the walk to school while Riley walks beside us picking up ‘birdy berries’ for them to throw like poke balls. Sonny hops off the buggy board every now and then but soon jumps back on when he realises he just cant keep up. Its foggy in the mornings, Autumn is in the air. We stop to admire all the cobwebs glistening in the bushes. You don’t realise how many are there until the morning dew makes them sparkle. There are twice as many leaves on the ground than last week, the boys love to scooch their feet along, gathering leaves up to their knees and its hard to walk. 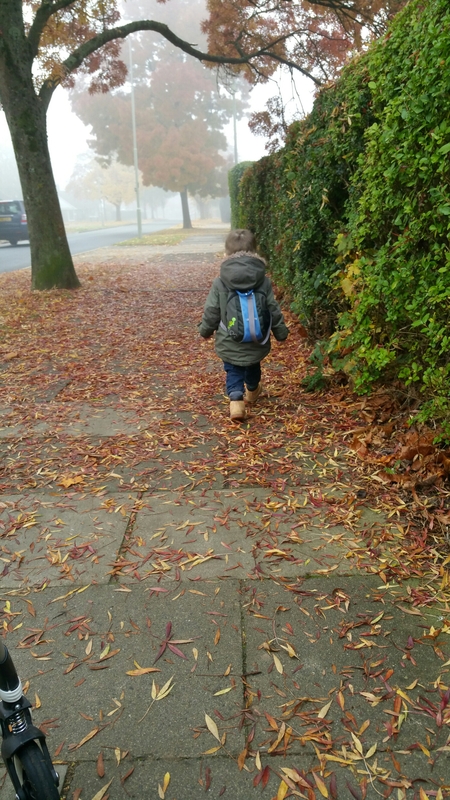 We get to school just in time, allowing that extra 10 minutes is crucial to us either being early and having a cuddle in the playground or arriving just as all the other parents are beginning to leave. I don’t like to start the week off being late. I hate being late. The boys don’t mind and they mill along with not a worry in the world. I remember being like that, those days were good. I’m glad you went in to school with a smile Sonny. I worry about you, I hate to see you struggle. You get so overwhelmed you hurt yourself and others around you. It breaks my heart. You make me laugh and break my heart all at the same time every day. Getting you ready school today was hard wasn’t it? Your collar is itchy and your socks are tickly. Your shoes feel strange and you don’t like to eat so early in the morning. The clocks went back and you don’t feel right. Its light in the morning again? Your pockets in your new coat are huge and you love that you can fit your dinosaurs and your trains in them with ease. You chew your fingers all the way to school. They look sore Sonny Bunny. You got cross with Riley this morning, he wouldn’t wait for you after I told him to. You jumped up on the board and we caught him up. He was sorry, he didn’t realise he was going too fast for you. You got cross that the Lollipop Man wasn’t wearing his popcorn socks. You didn’t want him to wear soldier socks. Maybe he will a have his popcorn ones on tomorrow. We got to school just in time. Riley went to his classroom just as the door was about to close. I don’t like sending him to school in a rush, but he looks behind and waves and blows me a kiss. I wish him a good day, tell him I love him and to be good. Sonny goes through the school office where he is met by his support teacher. He doesn’t go through with the rest of his class, it’s just too much commotion for him to start the morning with. Sonny has 1:1 support at school for all of every day, and they are amazing with him. He has his own personalised time table and his own black out tent for when he’s feeling overwhelmed or cross. Sonny has his own area of the classroom which has a desk just for him, a little book case with his favourite toys and books and a little display board which is decorated just to his liking. Lucky boy. We got there Sonny. First day back at school finished. You are so happy to go though the office in the morning. It makes for a much calmer you. You spot your teacher and jump with excitement! You give me the toys from your hands and pockets so you have free hands for your special greet handshake. How does it go Sonny? High five! Down low! Both together! Wiggle your bottom, let’s go! And off you go to spend a little time in the den, you’ll join your friends when everybody settled down for the morning. I wave you goodbye and blow a kiss and quietly hope that your day is kind to you.